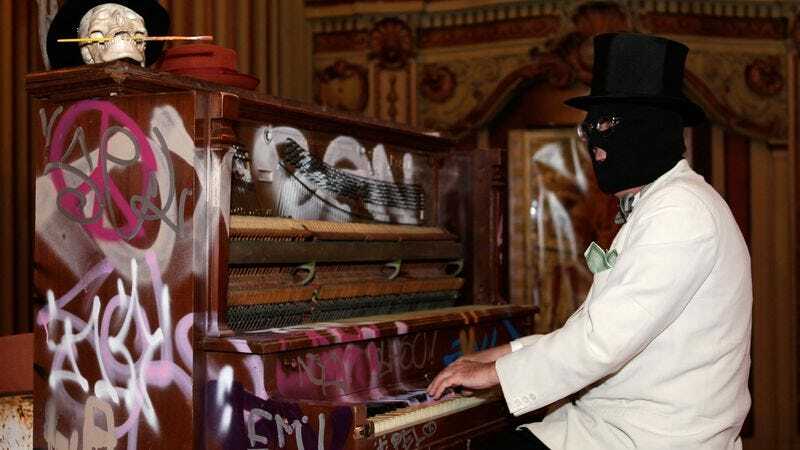 Theorizing about the secret identity of artist, theme park mogul, and living question mark Banksy has proven nearly as popular as the man/woman/sentient ambulatory hoodie themselves. (Which is to say, very popular several years ago, and less so as the time since Exit Through The Gift Shop goes on.) Now, The Daily Mail has a new theory about the identity of the reclusive artist, suggesting that part of the reason for his famed secrecy is that he might already be famous for something else. Specifically, for being a member of Massive Attack. Obviously, the evidence here is all hugely circumstantial, but it’s interesting to note that Del Naja is a noted graffiti artist in his own right, and actually appears in Exit Through The Gift Shop, talking about Banksy as though they were old friends. (Both got their start in Bristol, England.) There’d be something very on-brand for Banksy to appear on camera in his own documentary, just to taunt the world with the fact that his face was right there on the screen. That being said, it’s just as possible that the artist is just a huge fan of Massive Attack—or even a collective of artistically minded devotees—that follows the band everywhere on tour, killing phone booths as they go.